There still a lot of doom and gloom around so how about a supercar review?! It’s the Lamborghini Gallardo Spyder LP560-4 driven and reviewed by MTI regular contributor (and all round lucky B******!) Serman. There’s no easy way of putting this, but the Gallardo is like a blue movie. Case point: Filling up the LP’s tank and there’s a guy opposite trying not to glance across as his girlfriends’ blabbering away through the window whilst he’s pretending to check the pump counter. He’s obviously in a trance as his fixed glare in my direction reminds me of bunch of guys watching a dirty DVD on a lad’s night in and as I walk away he’s still fixated on the Gallardo’s lines. Mind you I also feel like Home Secretary, Jackie Smith, finding out that her husband has tried to claim for a few movies on the adult pay-per-view when I go to pay. I’ve just left the Lamborghini factory and roll back onto the aptly named Via Modena, the road outside Lamborghini’s HQ with a full tank of fuel to boot. Waiting for a gap in the traffic I catch blue movie guy in my rear view mirror still eyeing up the Gallardo whilst being dressed down by his other half for ignoring her. It’s one of those chuckling moments. The Via Modena is the long stretch of road running from San Giavanni through Sant’Agata, home of Lamborghini, stopping at Ponto Losco a few K’s down the road. Keep going and another twenty kilometres further on is Modena, Ferrari’s home turf. Sant’Agata is an odd town being a mix of residential and industrial fused by the Italian farm land spread neatly across the plains. Drive five minutes out of town and you’re transported into stunning country side. Unlike its Italian surroundings the Gallardo was designed by Audi’s protégé Luc Donckerwolke who graduated from Peugeot in 1992 before moving across to Ingolstadt. His CV includes the A4 Avant, Skoda Fabia and Octavia before heading up Lamborghini’s design in 1998. In a recent interview he admitted to be the only designer at Lambo’s HQ sometimes working alone for some seven years. Not that it shows. Now Seat’s design director, I can’t see ex BMW’s Chris Bangle getting to grips with Luc’s unique right hand. Remixed by Audi’s new placement, Walter de’Silva, the 2009 Gallardo has finally shaken off its German ownership and in my mind become a proper Italian supercar. Not that I’m complaining, sitting ahead of a tingling 5.2 litre V10. This thing doesn’t dance around the facts but delivers them like a punch to the solar plexus. It does make you wonder: The MK1 wasn’t a slouch with 493bhp and 193mph V-max, but when you peruse through the new press pack, 552bhp and 389lb-ft of torque doesn’t quite seem real. However you read between the lines and this new package is certainly Lamborghini sticking two fingers up at Ferrari’s next F430 replacement, rumoured to only have 500bhp. OK, so the friendly rivalry won’t finish here and the next ‘430 will have Ferrari’s superb seven-speed double clutch gearbox amongst other F1 derived technology, but I’m totally infused by every mechanical click, hum and vibration as I begin to wind up the V10. The exhaust note is much louder than the previous Gallardo, so much so as its signature gearshift ‘crack’ reverberates off the crumbling Italian stone walls. This also manages to hit your eardrums like a cupped hand ready to strike. Luckily the weathers’ playing ball and the hood’s been down since leaving the factory. Knocking on the door of 100mph the back wind doesn’t seem to blow up too much of gust but anyone with a bouffant hair-do isn’t going to be too pleased. Still, driving in Italy with this mighty machine, I’m definitely not moaning. 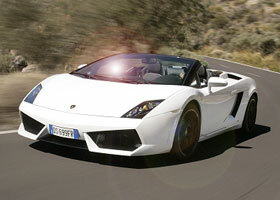 Lambo’s paddle-shifter (e-Gear) delivers every horsepower with the superb recognition. From a standstill the LP560-4 Gallardo just hoovers up the tarmac sending a very clear message on just how quick it is to anyone daring to take a ride. You can either let the electronics sort out 62mph in 3.2 seconds or try and keep up with everything going on around you and handle the paddle levers behind the steering wheel on your own. This is neck-snapping stuff mixed with a good dose of head-rush. Three-odd seconds doesn’t feel as quick as the figures suggest but before you know it 120mph is several hundred yards down the road. And if you’re feeling brave, or don’t have the presence of the Italian Police who also have Gallardo patrol cars breathing down your neck, just keep the pedal pressed down to see how fast you’re prepared to wind the LP up to before you back off. Even under acceleration overtaking slower cars, until you’re used to the 300-odd pounds feet of torque muscling its way into the equation, you always seem to over shoot your mark misjudging the gap completely and reigning in your next target way too quickly. All this extraordinary power and noise isn’t the Gallardo’s only plus point. I don’t mean to keep referring to Audi’s ownership but it plays such a big part with the LP. The price, £130,000, may be a home to you and I, but the exceptional build quality and the Germans impeccable no-nonsense approach certainly justifies five years’ salary to some. OK, so it has the switchgear from the A8 and is partly built at Audi HQ in Germany, but the comfort levels and ride quality really are second to none. Yes, it does have its niggles and the Gallardo isn’t perfect: like the seats not lowering enough meaning you rub the top of your head on the canvass roof, and adding in the options will bump the cost to over £140K, but this is Athena wall poster stuff. The suspension and chassis control gives a perfect ride balance. Yes it does hit (crash) over undulating tarmac but manages to sort itself out and delivers through the corners. The split 4WD system is part rear drive and when things become a little too much, transfers power to the front. This does throw in a tad too much understeer when you’re piling on the pressure, but fiddle with the traction control and you can dial some of that out and get more rear bias. This allows the back end to swing round on cornering, and get it right; you can perform the perfect drift. This all comes together beautifully thanks to a steering set up geared to perfection. Whether you’re trying to be Jason Plato on race day or taking care of your investment, the Gallardo LP560-4 Spyder is quite simply, breathtaking. Looks like my mate, blue movie guy back at the petrol station has decided to pay a visit to the Lamborghini Museum. As I pull back into the car park at Lambo’s HQ, I drive past him arm in arm with his other half who quickly goes from being a loving partner to blowing into a full argument. He’s done it again: Clocked the Gallardo and ignored the altro significativo. Looks like it really is an over 18s blue movie.